We’d love your help. 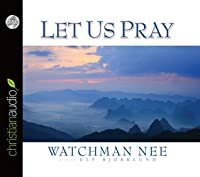 Let us know what’s wrong with this preview of Let Us Pray by Watchman Nee. 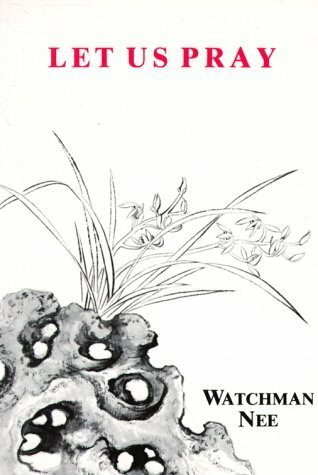 In this little volume of collected messages given over a long period of ministry by the author, Watchman Nee shares with us the lessons on prayer that he has learned through the years. To ask other readers questions about Let Us Pray, please sign up. I am all fired up after reading this! So inspired to again fight the good fight in prayer. I think every Christian should read this. In the beginning it was a little difficult to get into it, but after I hit chapter 2 I was so into it I finished the rest in one day. Chapter 5 was incredibly enlightening and encouraging in light of the fact that "For our struggle is not against flesh and blood, but against the rulers, against the powers, against the world forces of this darkness, a 4.5 stars. . . I am all fired up after reading this! So inspired to again fight the good fight in prayer. I think every Christian should read this. In the beginning it was a little difficult to get into it, but after I hit chapter 2 I was so into it I finished the rest in one day. Chapter 5 was incredibly enlightening and encouraging in light of the fact that "For our struggle is not against flesh and blood, but against the rulers, against the powers, against the world forces of this darkness, against the spiritual forces of wickedness in the heavenly places"
The only reason that I knocked half a star was because of a few comments that were made in the book that I don't necessarily agree with. Those two being that prayers made not according to God's will have little to no value in the kingdom. Personally, I think God cares about every thing in our lives, big or small. The other statement that I was confused about was this. "If the people of God fail to show sympathy towards Him by yielding their will to Him and expressing their one mind with Him in prayer, He would rather stand by and postpone his work." Again, personally, I don't know that these statements match my convictions. I also don't know if these things were just statements that were lost in translation (because this book was translated from Chinese) or if those were Watchman Nee's actual thoughts. "God never does anything against His own will. Since God's will is to open the door and since opening the door is in accordance with righteousness, will God nevertheless open the door if we do not knock?" A collection of Nee messages on the common topic of prayer, Let Us Pray lacks the unity and power of some of his better known works. That said, the opening meditation on the idea that God waits to do his will until we pray for it is worth the whole book. "God will not fulfill His will alone--He will perform only after His people show their sympathy in prayers." Born in Manchu China of Christian parents in 1903, Watchman Nee was active in the study and spread of the Christian faith throughout his life, including the translation of English spiritual works into Chinese. Not surprisingly, the Communist Chinese thought him a threat to their new state. He was arrested in 1952 and spent the last twenty years of his life at hard labor. The circumstances of his death prompt many to suspect he was murdered. Despite that seemingly narrow life, Watchman Nee influenced Christians around the world. His worlds are still popular and often quoted as received wisdom. His work came to my attention in the 1970s. Then I found his style dense and hard to follow, perhaps due to my poor preparation or the translation because now I find his writing clear and compelling. "Prayer is the occasion wherein to express our desire for God's will." I have greatly respected Watchman Nee for his discipline and his commitment to live in a manner that glorifies God. Sold out. - Prayer is a mystery; it is working together with God; it is speaking out of the mouth of the believer, the will of God; it is our will standing on God's side. - Our needs should be lost in God's will; God's will is for us I have greatly respected Watchman Nee for his discipline and his commitment to live in a manner that glorifies God. Sold out. - Our needs should be lost in God's will; God's will is for us to be so filled with His will that we forget our own interests. "True prayer is real work. Praying according to God's will and praying only for His will is indeed a self-denying work. Unless we are completely weaned from ourselves, having not the slightest interest of our own, but living absolutely for the Lord and seeking only His glory, we will not like what He likes, nor seeks what He seeks, nor pray what He wants us to pray. Without doubt, to work for God with no self- interest, is very difficult; but the pray for Him without any self-interest is even harder..."
- praying this way will shake up hell and affect Satan. Contains some very good principles to practice and/or keep in mind for prayer. However, I recommend not taking Nee's scriptural interpretation and theology at face value. Read with a careful and discerning attitude, always going to the bible and reading his quotes in the context of the larger passage. For example, in the first chapter he quotes Isaiah 45:11. "Thus saith Jehovah, the Holy One of Israel, and his Maker: Ask me of the things that are to come; concerning my sons, and concerning the wor Contains some very good principles to practice and/or keep in mind for prayer. However, I recommend not taking Nee's scriptural interpretation and theology at face value. Read with a careful and discerning attitude, always going to the bible and reading his quotes in the context of the larger passage. He interprets the passage to mean: What God does in heaven is commanded by our prayers on earth. He is awaiting our commands. The KJV translation is misleading on its own, but when you read the passage in its context, you can see that God is not telling us to command him, but rather God is clearly saying that it is not our place to question or command him. watchman nee is a genius no doubt. can be hard to read because there is so much information, and it is translated from manuscripts of sermons given throughout his life. nothing wrong with reading a wise mans thoughts on an important topic though. This book was an excellent read! The author explains the reason, the types of prayer and how to do it physically and by the scriptures. It truly educated me and the motivation gained is similar to a match-fire starter. To say I am stoked to pray is an understatement. I'm grateful that I've been blessed to have read this book by this author. Thank you Watchman Nee. Pray consistently, fervently, and with empathy for others. Pray from faith and for God's glory. Pray for God's will to be done in specific ways, for we do not have because we do not ask. God loves to bring us along the journey and include us in His works. Great message from the author. EVERY Christian should read this awesome book! We have been praying amiss but once you have read this book, there should be no stopping us in defeating the devil in all areas of our lives! We MUST understand and know that our Lord and Savior is for us and not against us! AWESOME, AWESOME READ! For anyone wanting to go deeper in their prayer life, this little book has some great truths that make you understand the concept/spiritual understanding of the value of our prayers. No nonsense, straight to the point shot guide from someone speaking straight from deep experience. Started out slow, but finished strong. Very helpful and well worth reading. An amazing book about prayer! Lots in here to think about. Perhaps plenty to disagree with too, but even in the disagreeing the thought provoked makes it worthwhile. Este libro fue publicado en los años 70's, para poder entender un poco mejor el contexto en el que se escribió debemos remontarnos hasta esa época, pero también conocer un poco acerca de los origenes y de la vida del autor. Oremos, es un libro bastante corto, en la versión presentada en la imagen apenas llega a las 91 páginas, lo importante es que Nee nunca se aparta del objetivo principal. Para muchos este tipo de declaraciones puede causar una confusión acerca del reconocimiento de Dios como Todopoderoso por parte de Nee, sin embargo creo que el énfasis de este tipo de comentarios intenta hacer incapié a la relevancia y la responsabilidad de los creyentes ante Dios y ante el mundo donde vivimos. Oremos es una invitación a estar en sintonía con los pensamientos y el corazón de Dios, para que eventualmente nuestros deseos y nuestras oraciones sean motivadas por los deseos y los pensamientos de Dios, o como Nee comenta: unir la voluntad del hombre con la de Dios. La segunda mitad del libro esta enfocada a la parábola de la viuda y el juez injusto de Lucas 18. Durante varias páginas Nee da su punto de vista acerca de está parábola y de varios principios aplicables a la oración. Dentro de estas explicaciones el autor ofrece los paralelismos de estos personajes con nosotros como hijos de Dios, el enemigo y Dios. Sin embargo creo que el diablo ocupa un espacio mayor no solo en las páginas, sino también en la relevancia dada como enemigo. Considero que es bueno conocer al enemigo para ser efectivos en la batalla, sin embargo considero de igual o mayor importancia conocer mejor a nuestro aliado para saber de lo que somos capaces. Oremos es un libro que personalmente recomiendo para todos, usa un lenguaje sencillo que puede ser entendido por un adolescente o por un adulto de igual manera y que ofrece consejos prácticos de alguien que de seguro exprimentó la importancia de la oración durante su ministerio. Paraphrased quote, "God's will is like a train. Whereas our prayers are like the train rails. Trains are powerful and can travel in any direction, but it must run on rails. God is powerful, but He chooses to be governed by our prayers. All valuable prayers lay rails for God. We must lay the rails in prayer for God's power/will to come forth on earth." Watchman Nee always gives inspiration guidance. I did find this book a bit repetitive. In fact, if seems to me to be a collection of individual essays since he references the same illustrations at times. That said, there are good nuggets contained in the book for those wanting to grow in their prayer life. This is my favorite book by this author so far. I was challenged to pray more and to pray more fervently by the author's insight into how our prayers open the way for God to do His work. When I think about how much my prayers are really making a difference, it makes me want to pray more. A bit rambly and repetitive despite being a short book. Theme: 'prayer is real work'. Rather too prescriptive - some good ideas, but I expected better. Changed my concept of prayer. A powerful book. Watchman Nee (Chinese: 倪柝聲; pinyin: Ní Tuòshēng; Foochow Romanized: Ngà Táuk-sĭng; 1903–1972) was a Chinese Christian author and church leader during the early 20th century. He spent the last 20 years of his life in prison and was severely persecuted by the Communists in China. Together with Wangzai, Zhou-An Lee, Shang-Jie Song, and others, Nee founded The Church Assembly Hall, later which would b Watchman Nee (Chinese: 倪柝聲; pinyin: Ní Tuòshēng; Foochow Romanized: Ngà̤ Táuk-sĭng; 1903–1972) was a Chinese Christian author and church leader during the early 20th century. He spent the last 20 years of his life in prison and was severely persecuted by the Communists in China. Together with Wangzai, Zhou-An Lee, Shang-Jie Song, and others, Nee founded The Church Assembly Hall, later which would be also known as the "Local churches" (Chinese: 地方教會). or more commonly as (聚會所) meaning "assembly hall"